I am sooo happy that sweater dresses are in right now because umm how freakin cute?! They are my absolute favorite because now we can wear dresses in all seasons!!! YASSS!! 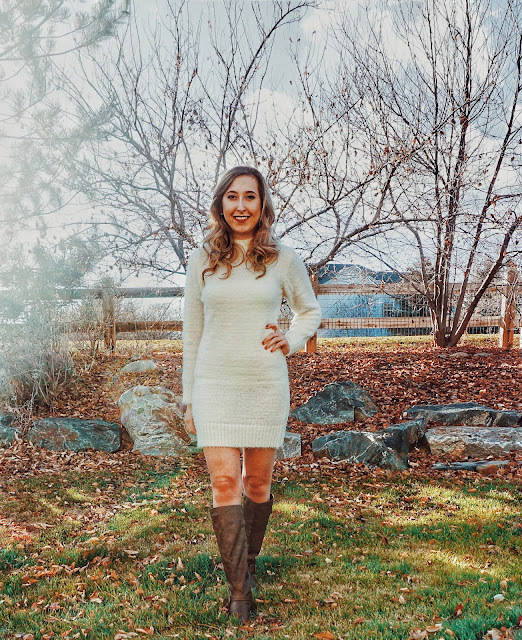 This sweater dress is actually from Burlington! I was surprised that they had great stuff because I've never shopped there before! This dress is sooo warm and fuzzy and it came in gray as well. I like how long it is because I can wear it with or without leggings. You could also pair this with over-the-knee boots (these are just knee length) and it would look super cute! (I actually think it would look better with over-the-knee boots but I didn't pull mine out for the pictures - I was too lazy lol!) This dress is actually no longer available but I have found a great alternative (almost identical) here (Miss Guided). I also thought these were super cute - here (Kohls), here (another Kohls), and here (Miss Guided - different color).